"Ventricular tachycardia (VT) storm refers to recurrent episodes of VT. Although any individual episode of VT can be broken, the overall process of recurrent arrests (or ICD shocks) creates a vicious cycle. Aggressive management is required including intubation, deep sedation, antiarrhythmics, and sympatholysis. Given the rarity of this condition, it's difficult to obtain high-level evidence or extensive experience. This chapter attempts to create an organized pathway, incorporating some emerging evidence regarding ultrasound-guided stellate ganglion blocks. The IBCC chapter is located here"
"Every now and again someone raises the issue on social media about resuscitative thoracotomy. What are the indications (we have the EAST guidelines for that), what are the risks (highlighted in this important recent paper), and of course, whether EM or surgery should be doing it in the trauma bay (guess what – it’s in the curriculum for both specialties). The end-point, ideally, is ROSC, when a few things may happen. The patient may wake up and so will require appropriate sedation. The internal mammary arteries may start bleeding and should be controlled with hemostats or tied off. Remember – you need to have a plan to get the patient expediently to surgical care and resuscitation should remain ongoing. Even if you do not achieve ROSC, at least you will know that when the decision was made to proceed with thoracotomy, you did the best you could for the patient." Metformin-induced lactic acidosis, et al. "Metformin poisoning and lactic acidosis has always been murky. For years there was debate about whether metformin-induced lactic acidosis exists (short answer: it obviously does). However, for an individual patient, it can still be confusing sorting out the contribution of metformin to their critical illness. A recent re-definition of the condition clarifies things a bit, but substantial confusion persists regarding how to diagnose and treat these patients." ClinicalTake Home Point: Manual pulse palpation alone can result in incorrect decisions in management of cardiac arrest patients and should stop being used in clinical practice as it is not sensitive or specific for pulses in cardiac arrest. DUSG is a nice secondary modality compared to CUSG but can have false positives and negatives for pulse detection. Some institutions have started using TEE, which would be the optimal tool for the job, however the majority of ED providers do not have access to TEE so it seems, in appropriately trained providers, CUSG > DUSG > Manual Palpation would be the preferred modalities, in descending order, for pulse detection in cardiac arrest." There is a wide differential for stridor, but this can be narrowed based on the timing of stridor in the respiratory cycle, age of patients, and acuity." 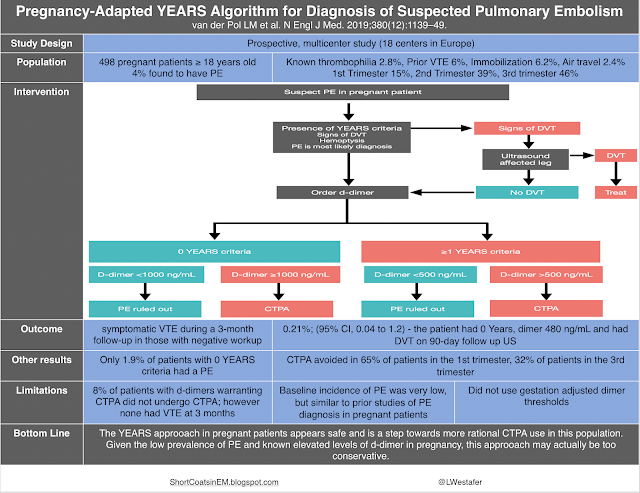 "The Gist: Use of the YEARS algorithm in pregnant patients with possible pulmonary embolism (PE) appears safe and results in fewer computed tomographic pulmonary angiograms (CTPAs), particularly in low-prevalence testing environments. 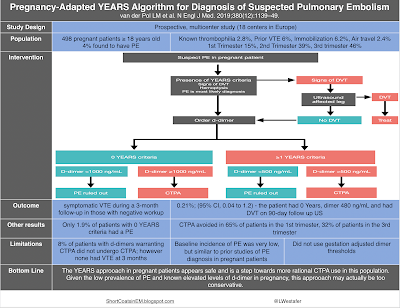 Given the natural course of d-dimer throughout pregnancy, gestation adjusted versions of this algorithm may better curb overtesting..."
t's pain radiating to the right arm we have to worry about! Crit Pathw Cardiol. 2019 Mar;18(1):10-15. ​It's time to get rid of the classical image of CP radiating only into the left arm. While this might still be the predominant complaint at presentation, it's the right sided shoulder/ arm pain we should keep a close eye on! And remember: a positive Troponin alone does not fullfill the diagnostic criteria of AMI! In patients with ischemic chest pain, IV nitroglycerin initiated within the first 24 hours of symptom onset reduces overall mortality. Aspirin at a dose of 162 – 324mg, provides protection against cardiovascular events (reinfarction, cardiac arrest, and stroke) as well as reduce all cause mortality"
"Abdominal compartment syndrome can result from primary abdominal pathology (e.g. bowel obstruction), but it can also occur due to systemic inflammation combined with large-volume resuscitation. As such, abdominal compartment syndrome is probably more frequent than generally perceived, functioning as an occult driver of multi-organ failure. Treatment is based upon physiological properties, involving many therapies aside from simply opening the abdomen." Pay closer attention to patients with chest pain that radiates to their right arm. In this multicenter study of patients with chest pain presenting to the ED, chest pain radiation to the right arm is more predictive of AMI than chest pain radiating to the left arm." What are some common signs and symptoms of subarachnoid hemorrhage (SAH)? How can pre-hospital providers manage suspected SAH? How is SAH is diagnosed and managed in the ED?" Although the authors conclusion makes it sound like a negative trial, as the gold standard in sepsis is to use lactate and not CRT, this study should be considered a positive trial, as it shows CRT is at least as good as a lactate-guided resuscitation strategy. Using a lactate-guided resuscitation strategy led to more fluid administration, more epinephrine used, and more vasopressors used without improvement in mortality (not statistically significant), compared to normalizing capillary refill time. 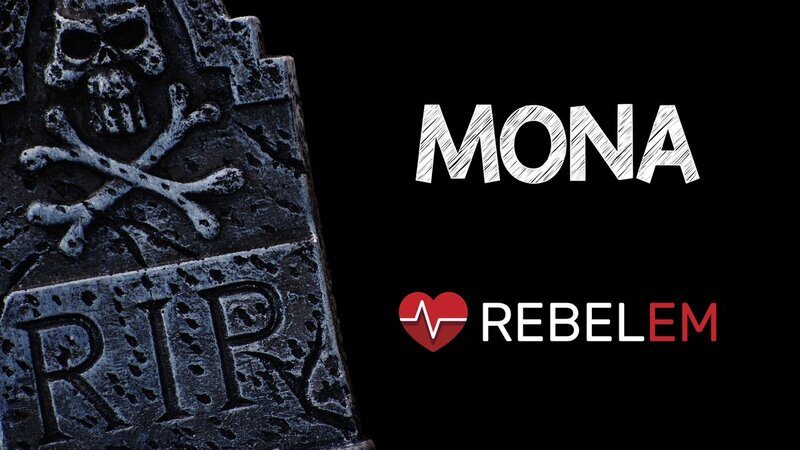 In other words, with a lactate-guided resuscitation strategy, we are doing more things that don’t make a difference in mortality…Which begs the question…should we be drawing repeat lactates in septic shock?" DEXACET: Four grams of acetaminophen a day keeps the delirium away? Acetaminophen has previously been shown to be an effective analgesic which can reduce opioid consumption. DEXACET shows that in a cohort of critically ill post-cardiothoracic surgery patients, IV acetaminophen reduced the incidence of delirium. This suggests that acetaminophen use may offer meaningful, patient-oriented benefit. Although DEXACET was performed with IV acetaminophen, other studies have found equivalent efficacy between either oral or intravenous forms. Acetaminophen is probably an under-utilized analgesic among critically ill patients. For maximal efficacy, oral acetaminophen should be given in substantial doses in a scheduled fashion (e.g. 1 gram q6-q8 hours scheduled, not 650 mg q8hr PRN). DEXACET isn’t incredibly robust statistically (fragility index of two). However, it validates longstanding principles of analgesia (specifically, the “analgesic ladder”). Until further evidence is available, it’s sensible to use these principles in clinical practice. This isn’t a revolution, but rather a reminder of first principles." HE is common in patients with cirrhosis and is the most common reason for readmission. Patients with cirrhosis who experience HE have an increase in mortality demonstrating the seriousness of this common disease. Clinicians should rely on the history, exam, and clinical suspicion when diagnosing HE, rather than ammonia levels. Causes of HE are typically due to increased generation of ammonia or decreased clearance. The most common precipitants include infection, GI bleed, dehydration, AKI, lactulose nonadherence, and constipation. Patients with cirrhosis are more susceptible to developing infections due to a dysfunction of host defense mechanisms as well as dysregulation of inflammatory cytokines. Diet and hydration status are critical in patients with cirrhosis. Dehydration is a common precipitant of HE due to use of diuretics, lactulose, large volume paracentesis, poor PO intake, and difficult medication titration post TIPS. Be wary of new medications in cirrhotic patients. Consider reviewing side effects of all medications used in patients with cirrhosis before prescribing to assess for hepatotoxicity: https://livertox.nlm.nih.gov/." And last, if you are doing a thoracostomy, you may as well go bilaterally. You are doing invasive things to a dying patient, there is no reason to guess where the problem is. Similarly, if you have to do a thoracotomy, you could consider making it a clamshell as it space to look into and making sure the right side of the chest is accessed." Despite the authors quoting a 17.8% failure rate with medical management of non-ruptured, hemodynamically stable, ectopic pregnancy with methotrexate, a more appropriate statement would be that in patients who received methotrexate without relative contraindications (pre-treatment bHCG level >5000mIU/mL, presence of fetal cardiac activity ectopic pregnancy size >4cm), 12 (9.1%), had an ectopic rupture, which is a more accurate estimation." "I’m back in the Midlands at the excellent and great value TraumaUK conference. If you’ve not been to this conference then I’d strongly suggest you do next year. It’s an amazing program and incredible value for money. As usual I’m in the emergency medicine stream bringing together the top 10 trauma papers from 2018-2019. As ever it’s a bit disappointing to find relatively few papers to talk about as I try and focus on those papers that might lead to a change in practice. Although there are a lot of publications out there, once you start applying the filters of applicability, quality and interest that number plummets. So here is my top 10 list based entirely on my own opinion. There is some repetition from past posts, but I’m OK with that as we can call it spaced repetition"
"Background: Standard management of septic shock has included, IV fluids until optimal intravascular volume is achieved, appropriate early antibiotics, and source control. Typically, only after all these measures have been undertaken is vasopressor infusion initiated if a MAP of ≥65mmHg is not achieved. Clinical Take Home Point: Although, this study confirms my own biases of initiating vasopressor therapy earlier in the course of patients with septic shock, it should be remembered that this study still requires external validation with patient oriented outcomes before implementation into routine clinical practice. Currently, in my practice, in patients with septic shock, I am starting with a Lactated Ringers bolus and assessing fluid status with RUSH exam. If my patient is euvolemic or hypervolemic, I am beginning my norepinephrine infusion at a much sooner time than waiting for 30cc/kg to be completed"
I would like to acknowledge Diane Lum, PharmD and Guang Mei Fung, PharmD for their assistance with my literature review. There must be an equivalent IV infusion dose to our standard IM dosing! But I'll be damned if I can find out what it is… So my best clinical recs based on experience actual patients we have tried this on. For a patient that is peri-code, consider 20-40 mcg/min (as best I can tell, the 0.3 mg IM we give is expected to last approx. 10 minutes, so 30 mcg/min is probably the mean over those 10 minutes (though I'm sure there is a peak/trough rather than steady state)). If someone is truly going down the poop shoot, giving half of an ml of cardiac epi (50 mcg) or 5 mls of EMCrit-style push-dose pressors (50 mcg) may be warranted." ..."Within the 2016 Surviving Sepsis Guidelines lies the following recommendation: ‘normalize lactate in patients with elevated lactate levels as a marker of tissue hypo-perfusion.’ This, however, is graded as a weak recommendation, low quality of evidence. Interestingly, buried within the text, the guideline authors declare – correctly – that ‘serum lactate is not a direct measure of tissue perfusion.’ Could there exist a better indicator of tissue starvation in septic shock? Almost 40 years ago, Champion introduced the idea of monitoring capillary refill time [CRT] for shock resuscitation. This low-tech metric fell out of favour during the zenith of invasive monitoring and oxygen delivery optimization in the 1980s and ‘90s. However, recent data have shown that CRT: 1. is potentially a more responsive resuscitation sign in sepsis than biochemical guides, 2. spares excessive intravenous fluids and their inherent harms and 3. predicts mortality in septic patients in the ED. Given the above, the ANDROMEDA-SHOCK trial was released last week at the 48th Critical Care Congress and the caterwauling was recorded immediately across multiple time zones. Do we dare worship this false idol? This Golden Calf called ‘capillary refill time?’..."